The Boxtrolls is now showing in Australian cinemas and is distributed by Universal Pictures. Though it is entertaining and visually captivating, The Boxtrolls is a film that is very confused about what it is. Lacking the charm it needs for young children to become enchanted, yet the film is not intelligent nor original enough for adults to feel like they get a great deal of enjoyment out of it. While the story lacks originality, the originality lies in the creative design of The Boxtrolls animation, which makes the film incredibly atmospheric in a rather quirky way. In a Victorian era town by the name of Cheesebridge, there lies a secret underworld in which the Boxtrolls make their living away from the townspeople who believe they are evil and dangerous creatures capable of snatching children from their own homes. 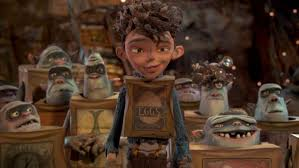 This belief stems from the power hungry, Archibald Snatcher (Ben Kingsley) who told everyone that he saw trolls kidnap a baby, when in fact the Boxtrolls adopted the child and he grew up thinking he was just a Boxtroll by the name Eggs (Isaac Hempstead Wright). 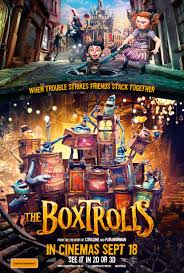 With the help of his new friend, Winnie (Elle Fanning), he sets out to prove that the Boxtrolls are not the evil everyone believes they are and to expose Archibald Snatcher for the evil that he is. The Boxtrolls is stuck somewhere in the middle of being a film for younger and older audiences and not in a positive way. The filmmakers really had an opportunity here to make the characters of the Boxtrolls endearing in the same way which the Minions are in Despicable Me and to make the film as a whole a piece of work which people feel an emotional attachment to, which would have worked for young audiences. There are some irksome scenes which may be unsettling to children, so with this boat missed, the films dark quirkiness seems to be more suited to adults who enjoyed past films such as Coraline and Paranorman. The visuals and the strange yet interesting world in which the Boxtrolls exist is to be enjoyed and appreciated, yet the story is rather unoriginal and predictable. The film's main theme is that humans are the real monsters and this is one that is hardly new nor is it presented in an original manner. The viewer may also be left with lingering questions as to why the trolls insisted on wearing boxes all the time to begin with, and how a boy who is brought up by these gibberish speaking creatures is able to speak and read English? While The Boxtrolls screenplay may not be intelligent, the animation certainly is. The creative design for the town of Cheesebridge is wonderful and the detail that went into the town, the Boxtrolls underworld and the characters themselves make them almost hypnotic to watch. It is rare for an animation film to be as atmospheric as what this film is, as the viewer feels immersed in this old English style town which one could imagine must smell continuously of cheese and feel rather musty. The Boxtrolls is filled with colourful characters and the voice actors all do wonderful jobs of adding to these interesting and odd personalities. Ben Kingsley does a great job at making Archibald Snatcher even more sinister and chilling with his wonderful vocal performance. Jared Harris also does very well as Cheesebridge's head man, Lord Portley-Rind and makes him an often detestable, but humorous character. Isaac Hempstead Wright does fine and Elle Fanning once again shows her versatility as an actress is in voice as well as physical performance. The target audience for The Boxtrolls is not well defined, even though it does tend to lean towards the younger audience being as it is a children's book that it is based on. The film is not as fun as it could be with it's interesting characters due to it's mediocrity in story and script.